Discussion in 'The South' started by Wildcat Strong, Jul 20, 2012. We will be able to print your waivers ahead of time with all of your information pre-populated. 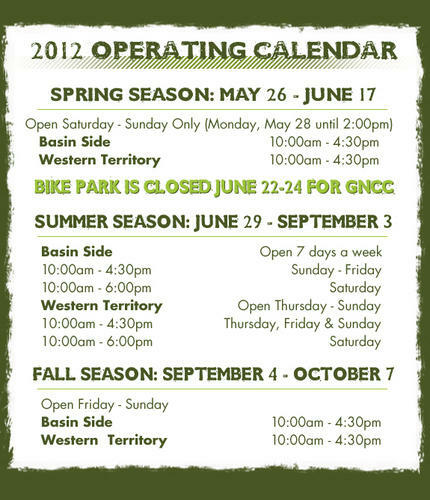 Non-season pass holders can also purchase their 2-day discounted bike park tickets during the pre-registration process. This means you just walk in to the Depot during registration hours and your registration packet will be ready. All you'll have to do is sign your pre-populated waiver, grab your packet, and go. Pre-register and spend more time on the track instead of standing in line at registration! Grab and Go Breakfast options will be available for purchase near the Depot as well! Course preview video will be posted by Wednesday... Stay tuned! Any lift/shuttle hours on Friday July 27? There is nothing posted on Bikereg or the SS website..... is my memory shot, I thought for Race 1 on Friday the lift was running? They should be on there summer lift schedule now which runs thur. - sun. on the western territory. Duh! I am getting older... in my mind I was getting June and July 29 crossed. I was even thinking why in the hell would they go to summer hours this Sunday. If you sign up to race do you still have to buy a lift ticket? Registered Racers must have either a season pass or a bike park ticket to access the lift & park. We offer our racers a discounted two day ticket for $59 plus tax for Saturday and Sunday (normal price is $75 plus tax)." Does it matter Dave? You need to go!